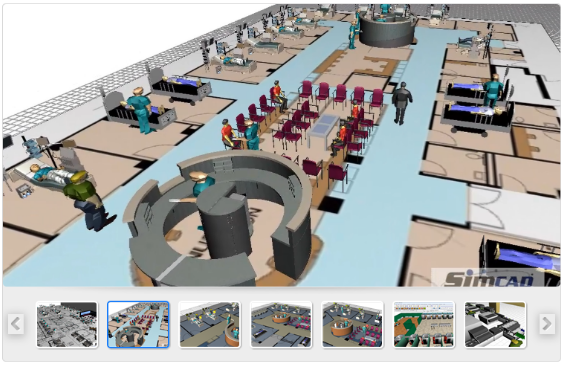 Healthcare Simulation Software, Simcad Pro Health provides simulation and modeling solutions to all the elements required to create an accurate replica of your operation in a virtual environment. 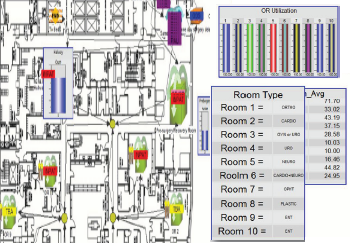 Improving the ED Emergency Department , OR Operating Room Department, Radiology, labs, bed allocation and internal supply chain are supported as integrated functionality within Simcad healthcare simulation software. This integrated functionality enables you to play the “what-if” game, analyze scenarios, and identify changes and Kaizen events to determine ROI Return On Investment and best path forward prior to spending time, money, and limited resources on untested changes. 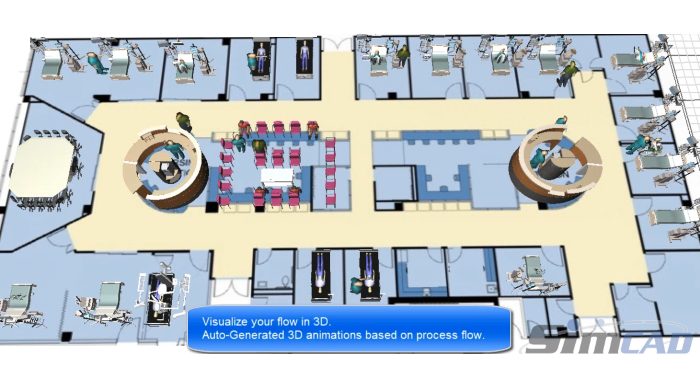 Healthcare simulation can also provide the means to test the impact of process improvement ideas in a virtual environment, without the risk of implementing unproven ideas to the actual patient flow. 2D and 3D animations are created to convey ideas of change, while detailed analytics and value stream mapping generate the required ROI Return On Investment calculation for each improvement. Typically a CAD layout, either 2D or 3D, will be imported. Next, processes, travel paths, timing parameters, and other defined data are input into the model. Models are built graphically, without code. 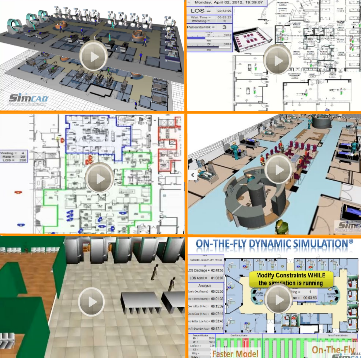 This is an important distinction between traditional and dynamic simulation environments. Patient arrivals times, patient timings based on diagnosis, patient pathways, etc… can be defined in real-time. OR Layout - The layout will be used to determine impact of travel distances, congestion, and room location on the overall flow efficiency. Build a validated model based on collected data. Patient care is one of the most important factors in healthcare today. The time a patient spends in the hospital, the staff they come into contact with, and their reason for being in the hospital all impact the overall effectiveness of a hospital. An increase in patient wait time can be affected by numerous elements: variability in patient arrival, poor patient flow due to check in procedures/architectural planning, and resource contentions caused by a lack of medical staff or poorly allocated resources. Dynamic Simulation provides a risk free solution to analyze, visualize, and optimize in Healthcare Systems. Dynamic Simulation allows not only for the relationship between entities to be maintained, but also for an immersive and interactive scenario development and opportunity testing environment. 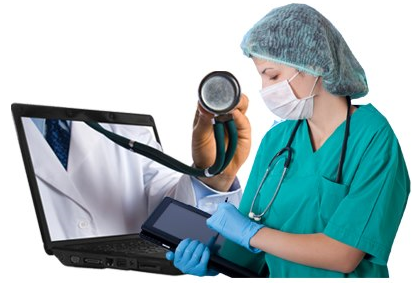 This allows the user to interact with the virtual environment and test, “on-the-fly,” any and all changes to layout, processes, patients, medical staff, profiling, scheduling, and more. You can test virtually any change you can think of that may have a positive impact on the operation without the risk and cost of testing different scenarios in a live environment. 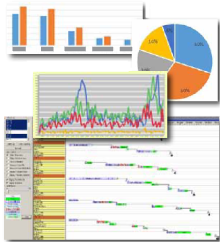 SimTrack Health is a Dynamic Execution System that utilizes Simcad Pro's patented technology to provide real-time operational visibility, dynamic replay, proactive forecasting, and customization reports.